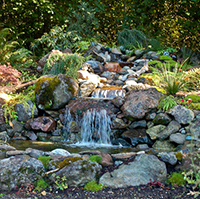 Garden waterfalls can be a wonderful addition to your garden. If you are not sure what options are out there, then you’ve found the right page. 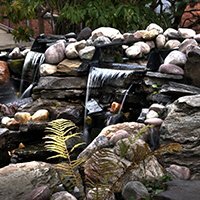 There are numerous options available for adding waterfalls and fountains to your rock garden, but finding one in your price range might be easier said than done. 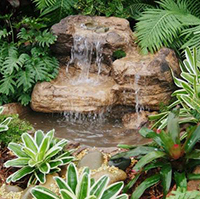 You can find fountains and waterfalls in a full range of sizes and pricing, starting as small as tabletop fountains for as little as fifty bucks, or you could spend tens of thousands on a pre-made, permanent structure that is completely self contained and just needs water. There really are very few limits beyond your budget and creativity. We’ll explain the options a little more. 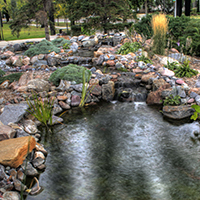 These are perhaps the most commonly found water features on the market. Many big box stores sell these as novelty items that you can put on your desk, or an end table, etc. They tend to be very simple in design, starting with a basin at the bottom that holds enough water to supply the entire waterfall. The body of the unit will generally consist of 2-4 small “terraces” that are angled such that the flowing water will feed into each one. The top of these miniature rock garden waterfalls will have some sort of an opening that the water flows out of, fed by a small submerged pump in the bottom basin. These units will almost always plug into any standard 110V outlet, which powers the pump that pushes the water to the top of the unit. When you turn them on, you are rewarded by a small but soothing flow of water that trickles through the pre-defined path. Some of these smaller units are even equipped with low wattage lights for added effect. 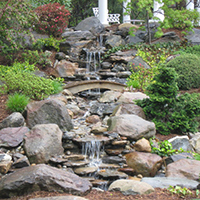 Most of these types of garden waterfalls make nice gifts or ornamental items, but they usually are not big enough to be useful out in the garden. While they are certainly affordable, they are best suited for tabletops for which they were designed. The vast majority of these smaller waterfalls will be priced from around $30, up to maybe $100 depending on where you buy them and what features you opt for. These rock garden waterfalls will be much bigger than their smaller cousins and at this level, you have a few more options to consider. The most popular materials these days for producing these products is fiberglass or resin, because it is not only strong and lightweight, but it can be molded into a variety of shapes, and painted to look like the real thing. You’ll find these water features will be in the ballpark of 1 to 3 feet in diameter and 3 to 5 feet high, making them versatile for both indoor and outdoor uses. Depending on what they are made from, you can expect them to be relatively light before the water is added, so one person can maneuver then easily. If you purchase one of these garden waterfalls that have a similar color to the rest of your home or garden, you can easily blend these in to the landscape for an incredible display. The design of these fountains and waterfalls is much the same as the smaller models, only much bigger and much more elaborate. Most of the products at this level are designed to withstand the rigors of outdoor use, but it’s always best to make sure before you buy one. These products will typically cost a few hundred dollars at these sizes, so you don’t want to waste your money on something that won’t last. These rock garden waterfalls are unique in the sense that they are designed to be hung from a wall, rather than supported by the ground. These products tend to be a little smaller than the mid-sized waterfalls, but still bigger than the tabletop models. Because they are mounted to the wall, the basins on them will hold a small amount of water to reduce the weight, and they tend to be designed around the concept of a stream of water from a spigot, rather than a natural waterfall. If you are into the Victorian era, or old Italian renaissance décor, these are wonderful additions and will fit in nicely. Just be sure to plan carefully and make sure you hang them within reach of a power source. Depending on how much of a design you’re after, you can expect to pay anywhere from $200, up to $500 for these types of units. These are among my personal favorite because these large scale rock garden waterfalls can really transform an ordinary garden, into the extraordinary! Before you go getting excited however, make sure you have your checkbook ready because these puppies aren’t cheap. You can find a few options around $2000 if you look hard enough, but they might not match well with what you already have. You should expect to pay between $5000 and $10000, just to get in the game. But what you get for that money is a veritable mountainside waterfall, designed to look like the real thing. If you have the money to go all out, these are the way to go. Some of these units are 8 feet to 15 feet across, and 6 to 8 feet high, so these are not small by any means. Typically they are designed to be set against a flat wall, with all the pumps and wiring and lights fed through behind the facade. You will probably need professional installers at this level, to make the product fit and look right, but if you have the desire and the money, you can use these to turn your backyard into a tropical retreat in no time. Now if fund are tight and buying one of these rock garden waterfalls just isn’t in the budget, you can always try building one yourself. You may find though in the long run, the cost of the materials to do it yourself properly, will end up costing you the same if not more than a unit from the store. It’s up to you how you will go but I hope we gave you some ideas for the journey!